These tools allow you to tune your carbs. 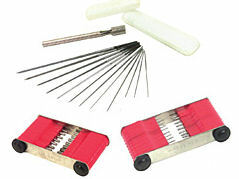 Full set of Reams with Ream holding tool and case. Also sold are 2 sizers to choose from, Sizers are used to check how big you are reaming to or what size your jets are. Sizers come in .45mm to 1.50mm and 1.50mm to 3.00mm . Click options tab to choose what you need. All 3 kits sold individually.